Trump budget director Mick Mulvaney sees need for caps. WASHINGTON — The $4.4 trillion budget that President Trump sent to Congress on Monday calls for steep cuts in domestic programs and entitlements, and large increases for the military, while envisioning deficits totaling at least $7.1 trillion over the next decade. The blueprint, which has little to no chance of being enacted as written, amounts to a vision statement by Trump, whose plan discards longtime Republican orthodoxy about balancing the budget, instead embracing last year’s $1.5 trillion tax cut and new spending on a major infrastructure initiative. The plan does not completely embrace the two-year budget deal struck by Congress and signed by Trump last week to boost both domestic and military spending by $300 billion. Mick Mulvaney, Trump’s budget director, informed House Speaker Paul Ryan, Republican of Wisconsin, in a letter that the president is proposing to pour much of the increased domestic spending in that package into defense and fixing “some longtime budget gimmicks” that have added to the nation’s deficits. 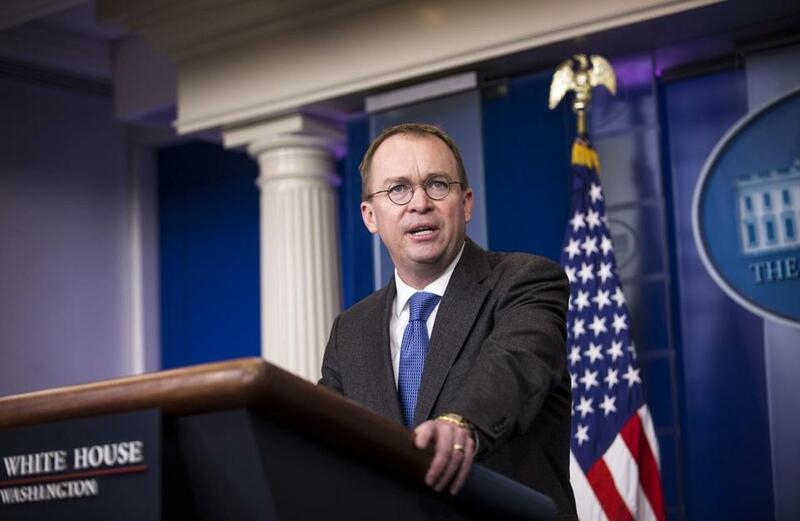 “The administration does not believe these nondefense spending levels comport with its vision for the proper role and size of the federal government,” Mulvaney wrote. 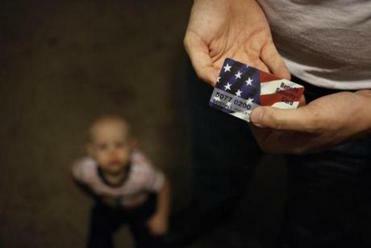 Republicans are targeting food stamps, Medicaid, and other social service programs for poor Americans. That bill, which Trump signed into law last week, would increase military spending by $195 billion over the next two years and increase nondefense spending by $131 billion over that period. But Trump’s budget proposal calls for a different approach and says Congress should not spend that nondefense money. The White House is proposing $540 billion in nondefense spending for 2019 — $57 billion below the new spending cap set by Congress. Mulvaney, in his letter, said spending at the levels Congress authorized would add too much to the deficit. “We believe that this level responsibly accounts for the cap deal while taking into account the current fiscal situation,” he wrote. Despite that approach, the proposal would add $984 billion to the federal deficit next year and would continue adding $7 trillion to the federal deficit over the next 10 years. Trump, who once proclaimed himself the “king of debt,” also calls for $200 billion over the next decade in new spending to improve the nation’s infrastructure. The proposal says Ronald Reagan Washington National Airport and Dulles International Airport, both in Virginia, are among the types of assets that could meet the criteria. Other potential assets that could be divested include transmission lines operated by the Tennessee Valley Authority. Presidential budgets are little more than vision statements even under normal circumstances, given that Congress controls the federal purse strings and may disregard the wishes of whomever is sitting in the Oval Office. That is even more true this year, after congressional leaders in both parties essentially went around Trump to strike their own budget deal that bore little resemblance to the one he was drawing up. Trump’s plan includes a request for $85.5 billion in discretionary funding for veterans’ medical care and $13 billion in new spending to tackle opioid abuse through prevention, treatment, and recovery support services as well as mental health programs. Trump’s second federal spending plan also proposes steep cuts for the Environmental Protection Agency, despite Congress’ rejection of a similar plan last year to dramatically shrink the agency’s budget. The fiscal 2019 budget blueprint would pare the EPA by $2.8 billion or 34 percent from its current level, while eliminating virtually all climate change-related programs. It also would cut the agency’s Office of Science and Technology nearly in half, to $489 million, from its current $762 million. In outlining the budget, the administration said EPA is refocusing on what it called “core activities” and eliminating “lower priority programs.” That list includes a program to promote partnerships with the private sector to tackle climate change; environmental education training; and an effort to protect marine estuaries. The White House estimated cutting those programs and others will save taxpayers $600 million compared with 2017 levels. More than 150 retired US general and admirals and 1,200 veterans have urged the Trump administration not to make steep cuts to the State Department, foreign aid, and other overseas programs, the Associated Press reported. Trump has proposed slashing the international operations budget by almost one-third.